By David Beckham, Director of Building-Integrated Photovoltaics at Walters & Wolf. Published by GreenBiz News. Since the beginning of the modern architectural era, humankind has dreamed of self-sustaining buildings that generate their own power. Futurists of the early 20th century looked ahead to the days when the sun would power our homes and commercial buildings and we would be transported to and from our workplaces in flying cars. Unlike the overly ambitious estimates concerning personal air transportation, today the concept of a solar-powered building is neither remote nor unachievable. Continue reading. 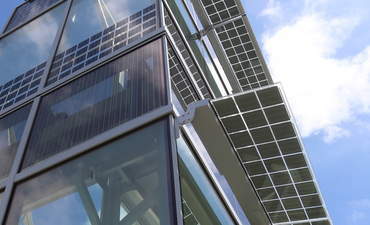 Photo: Walters & Wolf fully-engineered Building Integrated Photovoltaics (BIPV) façade powered by Solaria. This entry was posted in Green Building, Nebraska / Midwest News, NewsBlog and tagged Building-Integrated Photovoltaics (BIPV), GreenBiz News, Nebraskans for Solar, Walters & Wolf sponsored article on January 3, 2017 by Helen Deffenbacher.